Deadlines are hard to avoid in your working life. At best they can be stimulating challenges that stop you from falling asleep at your desk by keeping you on your toes. At worst they can lead to burn-out, when realisation sets in that a target cannot be met. When working for someone else, deadlines are usually set by someone other than you, unless you work for a kind manager, who asks you what time frame would be suitable for you. If you work for yourself, you have the advantage to set deadlines according to your schedule and ability. If you are running your own business, this can be a blessing but also a curse when you ignore careful planning. Setting realistic deadlines that don't stress you out is important for your reputation as someone your clients can rely on. Meeting your deadlines means that you take your business seriously and you have the tenacity to deliver on time, regardless of the little hiccups that could delay you behind the scenes. I often notice with creative people and empaths that they struggle with this kind of pressure. They apologise on social media or in newsletters for not delivering on their intentions. I've been there myself with my tarot deck, which in the end took five years to complete :). Nothing is worse than sending a newsletter to your clients apologising for a delay, because somehow life got in the way. Sometimes it really can't be helped, and that's okay. But sometimes it is also down to simple self-sabotage, which can be avoided, if you are aware of it. Mindfulness is the key, and combined with the Tarot can offer straight-forward solutions. - What is blocking me from reaching my deadline? - How can I remove these blocks? - What step can I take today to make progress? 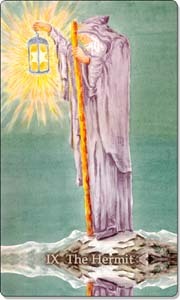 Let the tarot guide you into the right direction. - Be determined and keep going. - Believe in yourself that you can do it. When setting your deadline, make sure you include additional time to cover for the unexpected little hiccups such as short-term illness, holiday, sufficient time to relax etc. 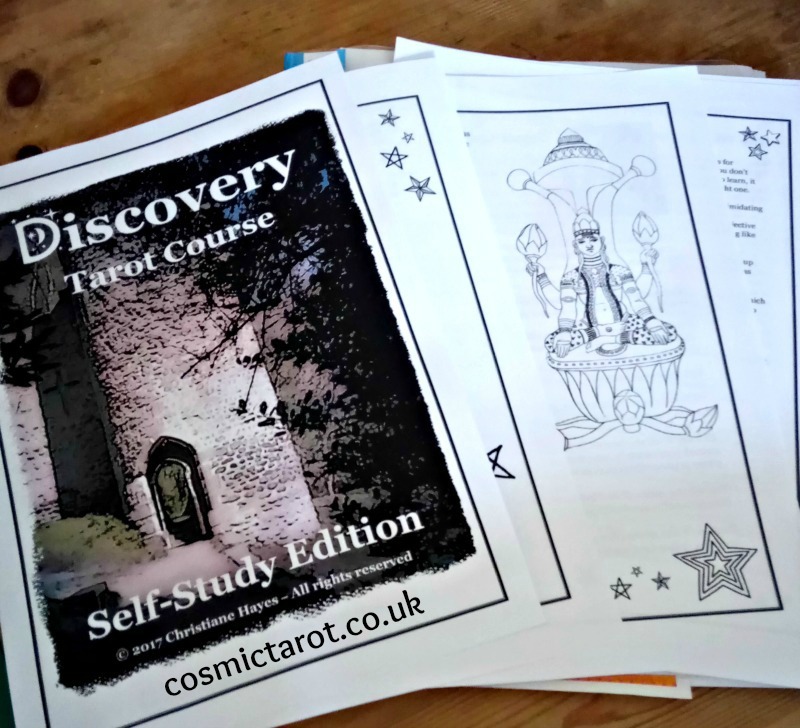 My current deadlines are the Tarot Moon Journal 2018 and the Cosmic Faery Tarot Guidebook. Yes, it's getting tight, but I'm still on target. In the meantime, join my free Facebook group for additional tarot exercises, spreads, journaling prompts and mindful musings. The Chariot takes you on a road trip, and along the way you can expect a bumpy ride. On the image the charioteer has turned her back on the safety of the walled city, and is moving forward into unknown territory. She is ready for this challenge, determined to achieve her goal no matter what. She knows it won't be easy, but that doesn't deter her. Still, at times when the going gets tough, she finds herself wavering, but her willpower and perseverance keep her going until she gets to where she wants to be. So what is the Chariot telling you in a reading about work and career? You start a new job or a new project, and perhaps you may even need to move to a new city, or it involves travel. You may decide to change direction in your career; think of the road less travelled, which scares you a bit, but the urge to do something different and succeed is stronger than your fear. The Chariot heralds a new beginning, but unlike the Fool, you know the reason for this journey and you have prepared yourself. You may be hitting a difficult period in your business. It may be a make-or-break situation, and you need to get through a time of hard work and stress not knowing what the outcome will be. If you are facing an ongoing struggle, the Chariot reminds you to stay focused on overcoming it and not give up. When the Chariot comes up for a new job or business venture, it indicates a steep learning curve ahead but the reward can be great. Don't be discouraged by setbacks or difficulties. You can overcome them with tenacity and self-discipline. The Chariot can indicate a test of skill and ability. Now you have to apply in practice what you have learned on a course. Walk the talk. No more teacher, mentor or supervisor to hold your hand and correct your mistakes; you're on your own. The Chariot is also about control; you're sitting in the driver's seat and make your own decisions on where you are headed. When working with others, you stand your ground and assert your position rather than holding back. This may lead to some conflict, but you don't let this stop you from getting work done and projects completed. 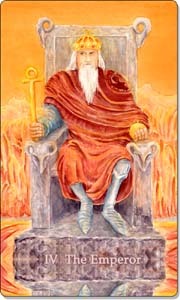 The Chariot can also suggest the strive for independence. You may start your own business, transition from employment to freelancing, or you may get back into work after a longer period of not working. 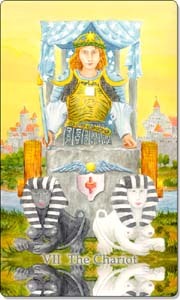 The Chariot is linked to Cancer, so expect this to be an emotional ride. 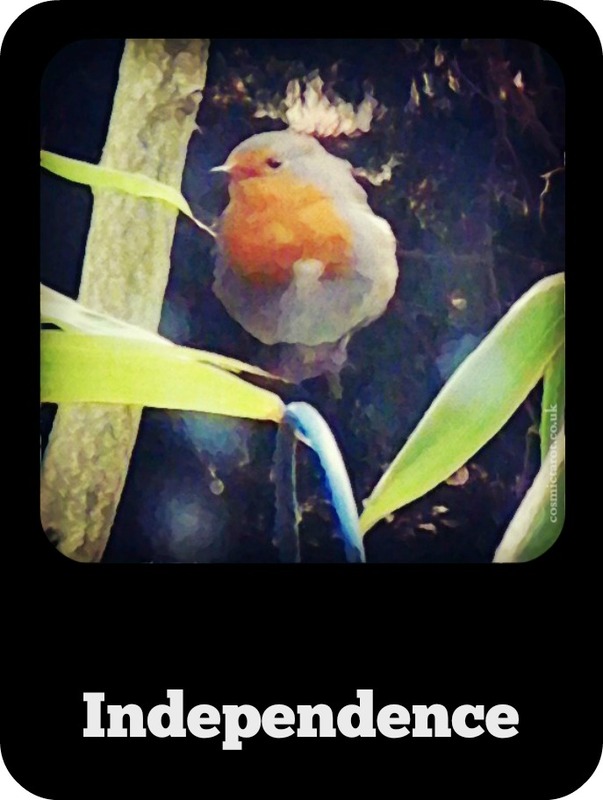 Watch out for overwhelm when you feel the pressure, and have regular breaks on your journey to recharge your batteries! Imagine the scenario: you share a fabulous business idea with a peer, ask for feedback and advice only to discover a few weeks later that this person has copied your idea and is already profiting from it. Something similar can happen in the corporate world, where you do all the hard work, and someone else (usually your superior) takes all the credit. 1. Be careful, who you trust. There are many wolves in sheep clothing out there. Even people you call friends can turn against you, especially if they work in the same field as you. 2. Send yourself a letter. In order to protect your copyright and intellectual property right, you can put all details of your idea in writing, add some sketches, photos, perhaps even a sample, and put all these items into an envelope or parcel. Then send it to yourself by recorded delivery. When you receive your mail, keep it sealed and protect the date stamp on the postage label. This will act as proof that you came up with the idea first, in case there is a lawsuit. 3. Before you share your idea with anybody, you can make the person sign a confidentiality agreement. Don't feel awkward about it, especially when you think your idea has the potential to make you serious money. First, have a quiet discussion with the perpetrator about the situation and establish all the facts. This includes providing the evidence that you are the originator of the idea they have taken on. If this doesn't work, don't hesitate to make it public if you have proof. Nobody should get away with theft, but do avoid mud-slinging. State the facts on your blog without getting too emotionally involved. Let your readers decide for themselves. Next time, keep quiet about your ideas. See advice number 1 above. Before you do, consider collaboration. You could add a complimentary product or service that will benefit you both. If you are still tempted, really try to stop right here. Let the originator of the idea get the credit, before you fall from grace. You will be found out eventually, and your reputation will be tainted. You will be taking a risk to get sued, especially if your victim has followed my advice above. Stealing someone else's idea is bad karma and in the long-term won't make you feel good or win you more friends. Why don't you just buckle down and generate your own effing ideas? Idea theft is something that happens so often nowadays in the work place and amongst creative freelancers. In a world, where it becomes more and more difficult to create something that truly hasn't been done before, for some people stealing seems to be the easy option to produce something. However, it rarely pays in the long-term. 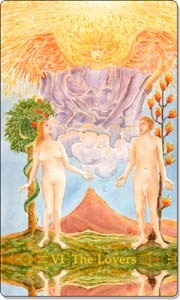 In Tarot, the Lovers are mostly associated with love and relationships. In a reading about work/career issues, this card could indicate a love interest connected to work, or a choice you need to make that affects both your work and relationship. This card may well ask you to pay attention to professional relationships in your working life rather than the amorous ones. Collaboration rather than competition - healthy competition is good for you, especially when you use it as inspiration to improve your skills and find your own niche. Network and build relationships with professionals you admire; likewise if a less experienced person approaches you for advice, then offer all the help you can give. In the long-term this will pay off as you will gain a reputation of being approachable, supportive and generous rather than selfish, ruthless and arrogant. Who can you collaborate with for mutual benefit? Teamwork - working in an office environment can be stressful at times mainly due to different personalities all trying to work towards the same goal and getting rewarded for it individually along the way. Effective teamwork is based on mutual support, respect and trust, individual accountability and constructive communication. What issues do you need to address to work more effectively in a team? Communication - working with others requires clear, concise, honest, respectful and regular communication. This includes talking, listening and the written word. Avoid gossiping, back-stabbing and getting involved in dramas. Be careful what you write in your emails, letters, reports or articles that will be read by others. Stick to facts and evidence rather than assumptions, accusations and hear-say. Reduce the amount of emails; also try to limit their contents to up to five short sentences. How can you improve your communication skills to interact more efficiently with others? Logic and Reason - keeping a cool head at times of stress and tension in the workplace can be hard, but it is important to avoid emotional involvement or reactions. How can you detach yourself emotionally from challenging situations at work? Choices - you may have to make some important choices regarding your working life. Changing jobs, changing your entire career, moving to a different department, starting your own business...you will need to weigh up these choices carefully; they are likely to affect the rest of your life. What would you like to improve about your work? What changes are necessary for you to achieve your goals? What do you want to keep, and what do you need to let go of? Love your job - Let's not ignore love totally, when the Lovers come up in your reading. If you are not enjoying your work, then this may be a good time for you to take the plunge and start afresh. If this is too radical for you, then the least you can do is explore what action you can take to feel more enthusiastic about your work. Sometimes it can be just your mindset that needs to change. What can you do to make your working life more fulfilling? Balance - here in the UK, the highly demanding work culture is putting pressure on people to work long hours leaving them stressed and exhausted at the end of the day. If you are one of those people, then consider paying more attention to your private life. Spend more time with family, friends, pursue activities you enjoy and relax more. Effective work/life balance will make you happier and healthier. How can you help yourself to have the best of both worlds? How can your workplace contribute to implement healthier work/life balance? The Lovers in a reading can act as a reminder of how important it is to build and sustain professional networks and business partnerships based on co-operation and mutual benefit. Re-evaluate your priorities including working less and living more. Perhaps you will need to brush up on your communication skills to work more efficiently. Heck, you may even get yourself into a fling or affair at work, and you will need to carefully consider its consequences. 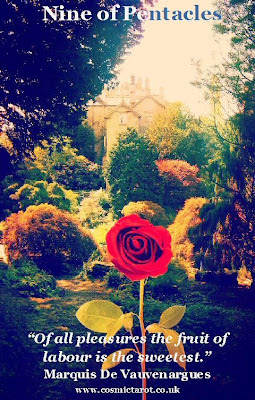 Most of all, when you apply the energies of the Lovers well, it can lead to the essence of this card: you will love the work you do. You have a dream. And that dream is success. But what is your definition of success? Is it money? Wealth? Getting on top of the corporate ladder? Selling your Art? Public recognition? Earning a living doing what you love? Success comes in many forms. Once you clearly know what you want, you can make plans, set goals and take steps towards achieving them. But how do you actually make that happen? What are the practical steps you can take to turn your dreams into reality? I call them 'secrets' of success, even though they are not intentionally kept secret from you, but not many people are aware of them or recognise them as vital components of the success formula. Journaling is about putting your vision, ideas and aspirations down on paper together with a step-by-step action plan on how to turn them into reality. In the business world this is commonly known as a business plan, which is vital, if you need to apply for a start-up loan. 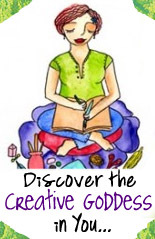 But as a creative and more intuitive soul, you can use more imaginative journaling. The key is to take stock every month and make adjustments if necessary. If you want to use the Tarot for this purpose, you could try my Tarot for All Seasons workbook, which contains Tarot spreads through the year that help you focus and stay on the right track towards where you want to be. For more intense and in-depth journaling, you can also use the Tarot Moon Journal to take into account astrological and in particular lunar influences. If you don't yet feel confident in using the Tarot for life and business planning, then you might like the Shining Year Workbook. Regular journaling is crucial not only towards success but also personal growth and development. Quite often you will notice a pattern or habit that might help or hinder you while you are writing about it. You will reveal what is hidden and make what is unconscious rise to surface. Don't believe me? I encourage you to give it a try. Download my FREE Manifesting Change cards and use them to start journalling, and change your life at the same time. Honestly, you can't do it all alone. You need to work with like-minded souls who are as driven and enthusiastic about achieving their dreams as you are. There are some fantastic Mastermind groups out there, where individuals come together and support each other not only with helpful advice but also some emotional support when the going gets tough. My online support group is the Shining Biz & Life Academy, where I've been a member since 2012, and over the last three years my Tarot biz has undergone a complete transformation. There are a wealth of eCourses and live training on offer. It's unconventional, but if you resonate with the design of what you see, then you will find that membership of the Academy may well be hugely beneficial. Let's put it this way: I have renewed my membership since 2012 every year and will continue to do so in the future. I think that says a lot. How many times have I seen people set their intentions, start their business and then give up six months or a year down the line, because they didn't make the money they hoped they were going to make? Well, first there is a reason why they didn't reach their goal. See point 1 and 2. They probably didn't do regular self-assessment and tried do do it all by themselves without being accountable to a peer group that would actively support them. Another reason can be they needed an income stream to sustain their livelihood. That's why it's unwise to give up the day job too quickly, and it may be necessary to combine your aspirations with a part-time job to keep you afloat. Most of all, a sustainable business doesn't create itself overnight. It takes time. I started self-employment in 2006, and my income from my Tarot business was unsustainable until 2012, when I started to turn a corner. So until then I had to subsidise my income with other income streams and part-time work. If you really want it, you can do it, but remember to implement these three secrets of success to give yourself the best chance to succeed. 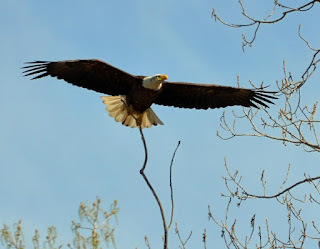 Today's guest blogger Sibylle from Gentle Miracles Coaching is sharing with us Bodo Schäfer's wonderful and humorous distinction between people who are "eagles" or "ducks". This article is based on something I read years ago, in a book by German money guru Bodo Schäfer. It’s such a wonderful metaphor, it’s stayed with me ever since, and I find myself applying the principle all the time. They are either eagles or they are ducks. What he means by this is most of all a difference in attitude. Eagles soar, they overview the entire landscape, the “big picture”. They rise above little obstacles and if they come across any vermin, they simply eat them. Now while ducks are lovely animals, they simply don’t have the scope and the perspective of eagles. Schäfer likens these qualities to people and says that “duck” people tend to stay stuck within their own limited horizon. Whilst the ducks are quacking, the eagles will figure out how it can be done. Schäfer tells about an occasion when he arrived in a hotel and the receptionist told him there had been a a double-booking and unfortunately, the room wasn’t available any more. That’s when he found an eagle. This person apologised profusely and then told Schäfer to have a drink on the house while she sorted out the situation. Within 20 minutes she had organized a small attic room which had been out of use for a while. It was cleaned and fresh bedlinen brought, and to top it all off, Schäfer wasn’t charged for his stay for that night. 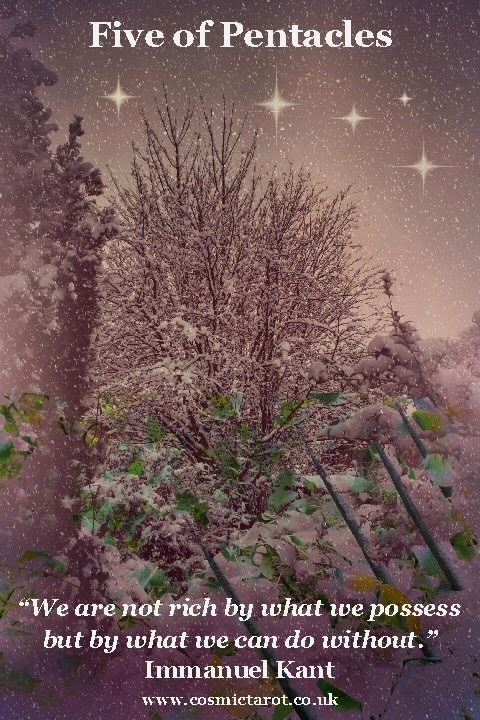 Are you beginning to see the picture? Eagles find solutions. Ducks find excuses. If you ever have a problem or an issue to solve, it’s pretty obvious that you’d want an eagle by your side, rather than a duck. What’s more, if you are an eagle yourself, your path through life will be a lot smoother in the first place. Eagles are the types of people who won’t give up at the first obstacle. They don’t waste their time “quacking” about the unfairness of life and how hard-done-by they are. Instead, they’ll get a ladder or a pole vault and get past the obstacle, moving closer to their goal. Always think in terms of solutions. Instead of thinking up reasons for why something isn’t possible, try and see how it CAN be done. Don’t ever waste time and energy complaining. It might feel comforting to whine and vent to your best friend, but the time would be much better spent on figuring out a solution. 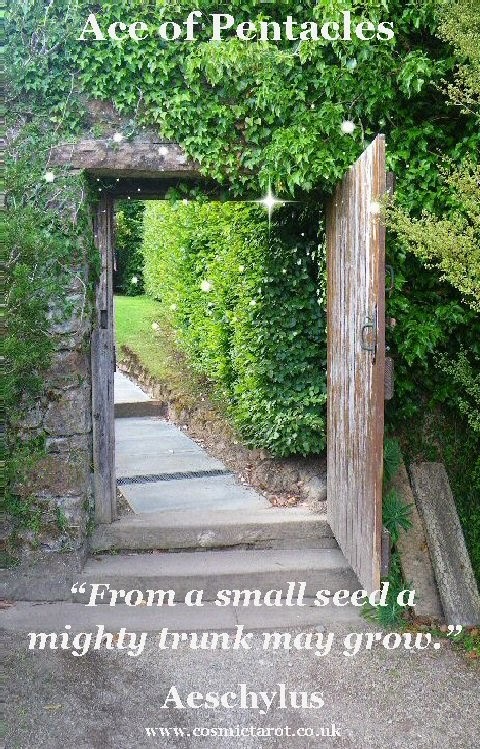 When you are faced with a problem which seems overwhelming or unsolvable, take a step back. Resist the temptation to say: “No way!” Rather, take a deep breath, get a cup of coffee or tea, and then make sure you really understand every aspect of the situation. Once you do, start brainstorming ways to tackle the problem. If you have any other eagles around you, it can be very beneficial to involve them in the brainstorming. Don’t censor, just jot down in keywords every crazy idea. Then afterwards, read through your list and determine which of them are feasible. Program your mind to see opportunities rather than obstacles, although it can be a bit of a challenge in a world which is so dominated by negative media. To counter their influence, read books like Cynthia Kersey’s Unstoppable for at least 15 minutes every day. You’ll see a big difference after only a few weeks of doing this. When you are stressed and it seems like you are surrounded by obstacles (or negative people), try and rise above it. Think “eagle” and imagine yourself soaring high into the sky. What’s the big picture? What is the context of the situation? You’re bound to feel much less claustrophobic immediately, and that’s when you think of ways to make it work. Happy soaring! I wish you many other eagles along your path. 1. Which traits of the eagle do I need to develop, and how will that help me? 2. 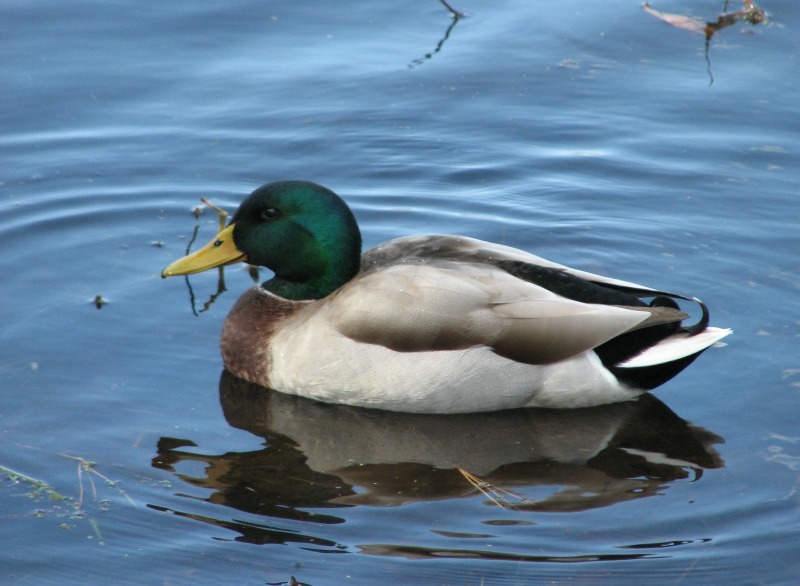 Which traits of the duck do I need to avoid, and how will that help me? 3. In which areas of my career / business is my duck mentality blocking progress, and what can I do to overcome it? As always, I'd love your feedback, and please take a moment to check out Sibylle's bio below and visit her website. This article first appeared in Sibylle's weekly newsletter Monday Sparkles, which I can wholeheartedly recommend. Sibylle is a certified tree hugger and also a trained and experienced Life and Business Coach. She believes that everyone deserves the experience of crystal clarity, laser focus, and achievement that comes with coaching. 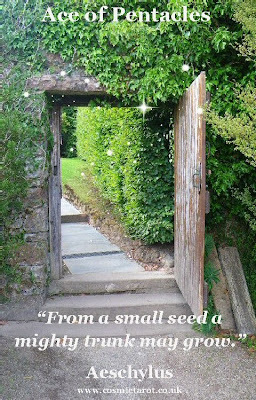 Sibylle lives on the beautiful West coast of Ireland and works with Coaching Clients from all over the world via Skype. Many people are useless with their money; they have no idea, how much they've got and what they spend it on. They overdraw their accounts and create expensive debts on their credit cards, rather than patiently saving up for things they want first. If you need some help with your money and learn to be more in control with your finances, the Tarot can offer some valuable tips. 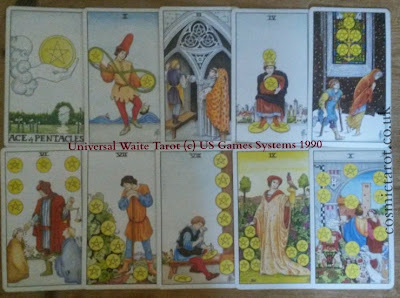 Although each card in the Tarot (from Major Arcana to the suits of Cups and Swords) can offer insight and advice on resolving your money issues, the suit of Pentacles is focused on money, possessions, home and wealth. Ace of Pentacles - A windfall, a bonus payment or new financial opportunities that offer a good return of your investment in the future. Aces are all about planting seeds that - when nurtured well - will turn into something precious and valuable in time to come, such as the proverbial nest egg perhaps in the form of a lucrative pension fund. What to do: start a savings plan, even if you just invest a little every month. Spending money on a training course will pay off later, if it enhances your skills and you can apply it in your work. Invest money in assets that will increase in value over time. What to avoid: risky investments, get rich quick schemes, spontaneous purchases and reckless spending you won't have anything to show for later. Two of Pentacles - a time when you need to juggle your money, because you have some unexpected expenses, and you need to cut back elsewhere. Money goes as fast as it comes, but the trick is not to succumb and overdraw your account. Debts are not the answer. What to do: be ruthless and cut out any unnecessary spending. Identify those areas in your spending pattern, where money just leaks away without you noticing, e.g. see how you can save on your electricity bill or avoid expensive branded products in the supermarket. Now is a good time to start writing down what you spend your money on and set your budget. Become your own Money Magician! What to avoid: getting into debt; ignoring financial warning signs, hoping for the best. 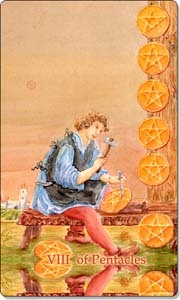 Three of Pentacles - While working on a project, such as renovating or sprucing up your home, you may need to enlist the help of skilled professionals. This may cost money, but it will be well spent. Nothing is worse than a botched DIY job. What to do: invest your money into something, that restores and increases value. Focus on your living or work space, where you spend a lot of your time. Upcycling, e.g. furniture and old soft furnishings. If you invest into your business, seek professional advice. Focus on quality. What to avoid: cutting corners to save time and money; this won't pay off in the long-term. Four of Pentacles - Take stock of how much money you have stashed away; can you afford to live a little, or do you still need to hold on to your money so tightly? It's good to be in control and be careful with your spending, but sometimes it's not so good to skimp, especially on necessary repair bills, essential foods and clothing. You can enjoy life and have a good time without blowing all your life savings. 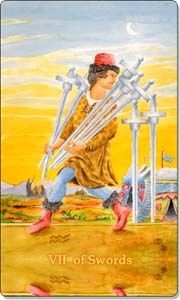 Five of Pentacles - Tough times financially. It's hard to make ends meet. A time for thriftiness and frugality. Getting back to basics and making the most of what little you have left. Sometimes a purge of material possessions can help you gain a new perspective on what "things" you really need and what you can do without. What to do: reduce your spending to the bare essentials; review your remaining assets; consider selling some of your possessions, but also explore how you can make money using the knowledge and skills you have. Ask for professional advice and help, if you have debts or lost your job. Be persistent. What to avoid: isolation and trying to fix your money problems all by yourself; giving up, despair and resigning to poverty. Don't be shy or proud to ask for the help you need and are entitled to. Money blocks and blaming others. 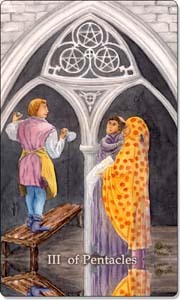 Six of Pentacles - You may need to apply for a loan or a mortgage, or you feel generous and donate money to good causes. Invest wisely and reap rewards later; be charitable and nurture your heart. Give and take in equal balance. We are all givers and receivers throughout our lives. What to do: repay a debt to stop it from growing. Offer financial help, if you can afford it. Consider donating to and buying from charity shops to support good causes. If you are entitled to benefits, apply for them. What to avoid: don't let your generosity be exploited; watch out for cons, who appeal to your kindness. Pay-day loans will haunt you for a long time. 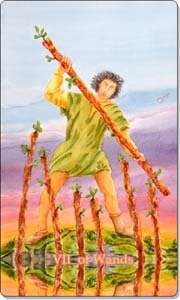 Seven of Pentacles - Money keeps trickling in steadily, but there hasn't been growth for a while. You may need to be patient or take a risk to increase your income. What to do: find new ways of an additional income stream. Invest into a business venture you are keen to work on, but don't give up your day job yet. Make sure you always have your basic living costs covered. Start a new savings plan in addition to the ones you already have. What to avoid: rash decisions and indecisiveness. Take your time exploring opportunities, but don't ponder on them forever or you might miss them. Abandoning what you already have for high-risk ventures and investments. 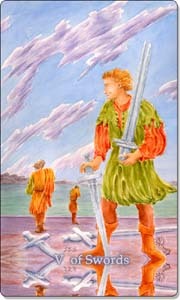 Eight of Pentacles - You need to work hard and all hours to keep your current standard of living. Is it worth it, or is there a better way? Money should work for you, not the other way round. What to do: investing into learning a new skill or enhancing an existing one, can help you demand a higher salary in the future without working your socks off. Applying for funding for a business project or further studies. What to avoid: cashing in a savings plan prematurely. Making major financial changes. Nine of Pentacles - Trust your instincts in money matters; you tend to be on the right track. Investments into land and property are likely to offer an excellent return in the future. Good money management gives you a feeling of abundance and stability. What to do: reap rewards and enjoy the good life without going overboard. Maintain and nurture what you have. You may not lack anything now, but ensure you won't lack anything in the future. Focus on self-reliance and financial independence. What to avoid: complacency and recklessness with money. 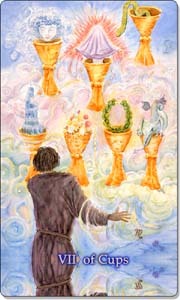 Ten of Pentacles - Create a legacy and ensure you and your family are taken care of, if the worst happens. Having to fulfil your financial obligations and responsibilities may stifle your flexibility. When it comes to possessions, less is more. What to do: life insurance, health cover, pension fund... If you are due a payout, consider re-investing it to build on what you have already gained. Unless you love and use those family heirlooms, sell them if they just collect dust in the attic. What to avoid: becoming a slave to your debts and material possessions. Being too attached to material things. Hoarding rather than selling. Keep a written record of all your expenses, from food shopping to nights out. This way you can identify careless spending and make adjustments. Do you really need to buy that expensive take-away coffee from Starbucks? By writing down each and every expenditure, you gain control and make better decisions on where and what you spend your money on. simply remove the ten cards from your deck, shuffle them and draw a card. What does it advise you to do? Get on top of your money issues, take charge and start creating abundance with the Tarot.